The Y-703 designed by Sam Sangiovanni for OceAnco, is expected for delivery in spring 2008. The steel hull and aluminium superstructure, is currently at an advanced construction phase at the new Dutch shipyard's premises. The below deck area is to comprise a Master's suite, two large VIP cabins and three twins as well as the crew's quarters that can sleep as many as 15. Areas of common use are of course not wanting and include a saloon and dining area, as well as the service areas such as the live-in galley and a full wheel house. The futuristic design fully reflects the technical equipment on board which includes everything possible to cruise safely and very comfortably; this includes two Quantum 1800 Four-fin Zero Speed stabilizers, latest entertainment equipment and "water toys" of generous proportions. For further information please contact: OceAnco Monaco - Gildo Pastor Center; 7 rue du Gabian; MC 98000 Monaco; tel. 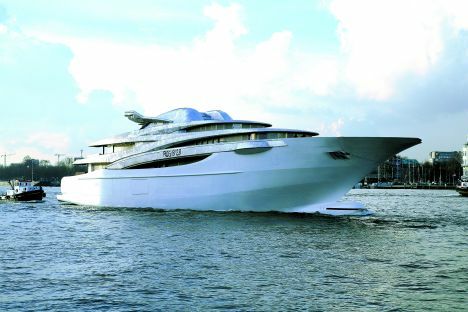 +377 93100281; fax +377 92056599; web site: www.oceancoyacht.com e mail: oceanco@oceanco.mc.